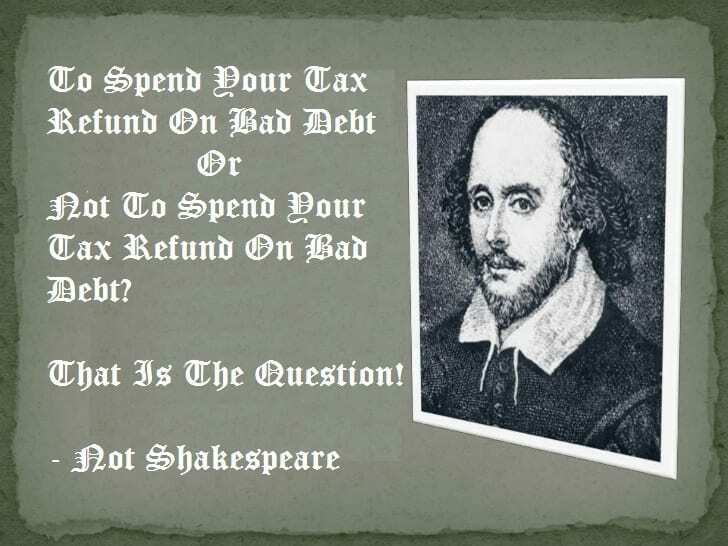 To Spend Your Refund Or Not To Spent Your Refund On Bad Debt? That Is The Question! Shakespeare was not the only person to experience dilemmas in his life and in his writing. Life is like walking backwards. You see clearly where you have been but where you are going is not always clear. You do your best. The same is true about our financial lives. Every year tax refund recipients are faced with the same universal question, “Using my tax refund to pay debt, often bad or delinquent debt, or enjoy a little fun?” Unfortunately, our school system does a pathetic job with financial education. That is made worse by paying teachers comparatively low wage in terms of the importance of their task … to educate our children. When a person has a financial setback too often the path to recovery is very unclear. Our inclination is to do what we have always done, pay, pay, pay. However, this seldom returns us quickly to the good credit and financial success we once knew. Our fixation or fear of making a change or taking a different path is truly the problem that holds us back, not our financial setbacks. You may have heard the expression “insanity is doing the same thing and expecting a different result”. I heavily paraphrased. Buying your way out of bad credit and delinquent debt can work … if… the amount of debt is fairly low. The lower the debt, the less need for a large lump sum to settle or pay the debt. Often when you add the high interest rates and finance charges that have been accumulating on the debt, paying or settling is often not the most cost-effective way to recover. How long will it take to 1) pay off the debt, 2) have the monthly negative reporting stop, and 3) go through a recovery program, like the one offered to the clients of Merna Law which can help guide your after-bankruptcy credit score back to the “good credit” range? Time is valuable. If your plan is longer than 60 months or 5 years keep reading. What will it cost to pay off the bad debt? Throwing this year’s tax refund at a small percentage of your bad debt with no plan of how to deal with the rest of it is not advised. We have too many clients that visit us in July after dumping $5,000 or $6,000 from their refund in February on part of the debt. You have to have a comprehensive plan to resolve all of the debt or you are throwing your tax refund down the toilet. Difficulty, or the risk of failure, is the third thing to consider. I always say “Bankruptcy is the fastest, cheapest, and easiest way to recover you credit.” You will note I hit the three factors we are discussing here. If your plan of repayment or debt settlement is too speculative or has a high risk of failure then points one and two are overridden and bankruptcy might be the best option. Whatever you decide, the bankruptcy attorneys of Merna Law are here to help with a free consultation so you can bounce you plan off of them. Schedule an appointment online or give us a call today at 800-662-8813. Our offices also serve the following cities in Virginia: Petersburg, Norfolk, Gloucester, Hampton, Williamsburg, Henrico, Suffolk, Portsmouth, Yorktown, Midlothian, Chesterfield, Richmond, to do a Virginia chapter 7 or a Virginia chapter 13. We also prepare Virginia Homestead Deeds.